The University of Notre Dame has opened its annual competition for the Naughton Fellowships. The prestigious international fellowships provide funding for exceptional Ph.D., masters, or undergraduate students with an aptitude for the STEM disciplines to complete research or study in Ireland or at Notre Dame. The following fellowship opportunities are currently open for applications. Faculty from the University of Notre Dame (ND) and either Dublin City University (DCU), University College Cork (UCC), University College Dublin (UCD), the National University of Ireland, Galway (NUIG), or Trinity College Dublin (TCD) should submit a joint proposal, identifying co-advisors and the research plan. Two fellowships of $120,000 USD will be awarded to the faculty advisors for the students’ period of study. All applications are due by December 2, 2016. 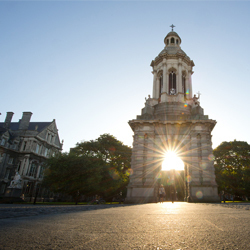 ND students can apply for a taught or research master’s degree at DCU, TCD, UCC, or UCD. Fellowships include a full tuition waiver, as well as a $20,000 USD stipend for living expenses, plus cultural enrichment programming. All applications are due by January 29, 2017. Irish students from DCU, NUIG, TCD, UCC, or UCD can apply for a master’s degree in Notre Dame’s Engineering, Science, and Technology Entrepreneurship Excellence Master’s (ESTEEM) Program. Fellowships include a full tuition waiver, as well as a $17,000 USD stipend for living expenses, health insurance coverage, plus access to cultural enrichment programming. All applications are due by February 24, 2017. Ten-week research experiences for ND students are available at DCU, TCD, UCC, or UCD. Fellowships include airfare, accommodation, a stipend, and cultural enrichment programming. This program will open for applications in the coming weeks; please check naughton.nd.edu for further details. Ten-week research experiences for Irish students from DCU, UCC, UCD, and TCD are available at the University of Notre Dame. Fellowships include airfare, accommodation, cultural enrichment programming, and a stipend for travel and living expenses. This program will open for applications in the coming weeks; please check naughton.nd.edu for further details. The Naughton Fellowships allow students with a background in, or aptitude for, STEM fields to experience international research and educational opportunities through a funded exchange program involving the University of Notre Dame and some of Ireland’s leading research universities. Irish undergraduates, master’s students, and Ph.D. candidates can come to Notre Dame on the fellowship, while Notre Dame undergraduates, master’s students, and Ph.D. candidates can travel to Ireland to study and complete research. For more information, including full application details on each of the available programs, please see naughton.nd.edu. Originally published by Joanne Fahey at science.nd.edu on November 02, 2016.